A story about protesters vandalizing Brett Kavanaugh's house to the tune of $11,000 in damages went viral about four days ago and was first debunked by Lead Stories. 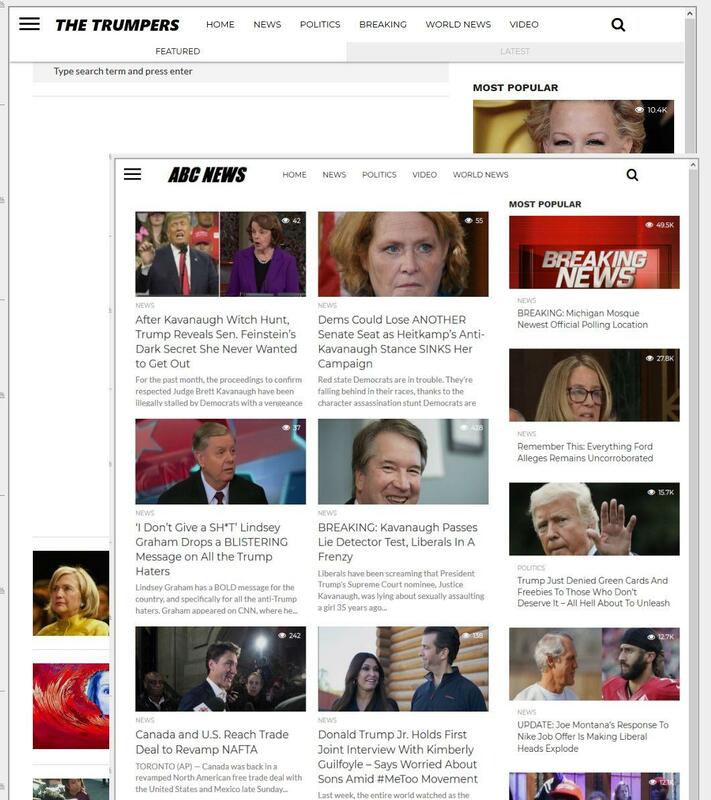 It originated from a liberal satire website run by Christopher Blair but went massively viral in part because a copy of the article appeard on a fake news website using the logo and imitating the domain name of ABC News (abcnews.live instead of the real abcnews.com). The fake site was taken down two days ago (probably after a DMCA complaint) but it has already been replaced by a new site Lead Stories has learned. Did protesters damage the family home of Judge Brett Kavanaugh to the tune of $11,000? No, that's not true: the story was made up by a liberal satire website which aims to get conservatives and Trump supporters so angry they don't realize they are sharing fake news, even though the site is plastered full of disclaimers. The original version ended up with about 9000 engagements on Facebook while the stolen version got around 14,000. That is not counting the version that got turned into an image which also got widespread distribution on social media. 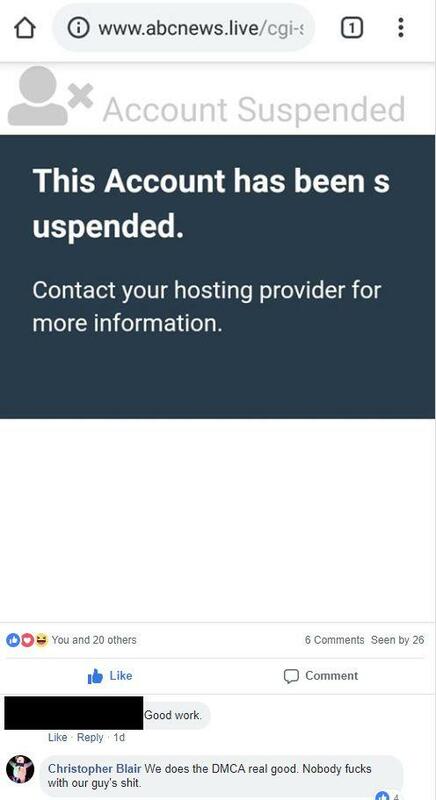 The site had indeed been suspended and DMCA complaints can only be made by the copyright holder or their legal representative so it would seem plausible that it was Christopher Blair who got the site taken down, especially since he has taken similar action against other websites with similar results in the past. It could conceivably also have been ABC News complaining about the use of their logo though. Notice it uses the same nameservers? That's not the only thing in common. The new site is hosted on the exact same IP¨address (199.192.23.190) and uses the same Google Adsense account (ca-pub-6634165152903391). There is also at least one common article on both sites ("After Kavanaugh Witch Hunt, Trump Reveals Sen. Feinstein's Dark Secret She Never Wanted to Get Out") and they both seem to copy stories from Christopher Blair websites. The two also look quite similar, check the archived versions here and here. Several of these sites were registered by by people from Macedonia or by someone claiming to live in Greenville, South Carolina but using a Bulgarian telephone number. Somehow we suspect trumpers.live won't be the last site we'll see in this list.